We are well into the summer months now and still most of South Africa’s crop producing regions has received little to no rain at all. This is very concerning. We are certainly experiencing intense drought conditions. This is a difficult position for a farmer to be in as we are faced with a big dilemma. What should we plant, will we be able to plant, will the drought persist, how will my business survive if we do not get any crops in the soil? Indeed tough times lie ahead, but it is these difficult circumstances which teach us to be resilient and strong. The planting season which is upon us will be a season where we as farmers will need to think on our feet and adapt to the environmental conditions presented to us. We may need to change plans and develop new and unique strategies to deal with the drought. In this article I would like to discuss the advantages of planting sunflowers in a year like the one we are experiencing. Perhaps your plan was to plant all of your lands to maize, but now the time is running out. In the warmer maize producing regions of South Africa such as the Free State and North West, many people use Christmas day as the benchmark cut off day for maize planting. If the weather prevents us from getting our pips in the ground before this date then fortunately we do have an alternative option. We can plant sunflowers. Sunflowers are much more resilient to drought conditions and also to cooler weather. This is why we are able to plant later in the season, as cold snaps in autumn will not severely disrupt the maturing process. We can safely plant sunflower from November into February which gives us a big window of opportunity to take advantage of. So when the late rains arrive we can take advantage of that moisture. 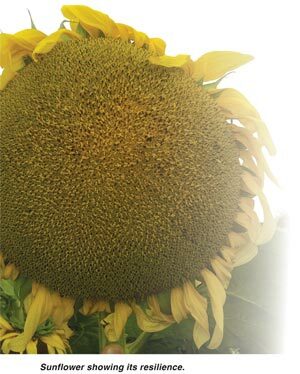 Depending on variety, sunflowers will mature and develop seeds in between 80 days to 120 days. Another advantage of planting sunflowers is that their input costs are not as high as maize. This is especially significant in a year when sunflowers are actually your ‘fall back’ crop which makes the expense of purchasing a second lot of seed a little more manageable. 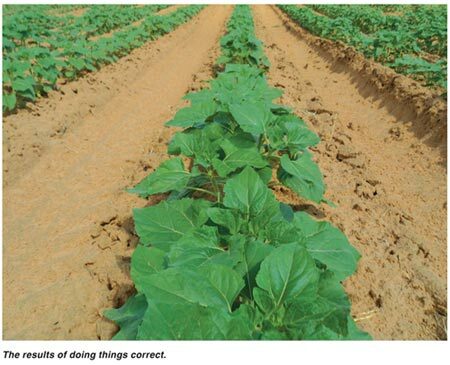 The fertiliser requirements for sunflowers are also not as high compared to that of maize. This does not mean that we should not apply fertiliser. Sunflowers thrive on nitrogen, but as they have a very deep root system it is important to apply it soon after planting. Your previous year’s fertiliser program will also come into play as sunflowers draw from the nutrients in the soil from last season. This is an indication of how deep these root systems can go. Although there are many advantages associated with planting sunflowers, especially in drought years, there are certain factors to be aware of. You should be careful not to plant sunflowers continuously, year after year. This will deplete the soils nutrients and the soil will become very acidic. Rather include it as a rotation crop. Obviously in drought years we are left with very few alternative options. One should also take special care of the crop at the emergence stages. If the soil has formed a crust the plants can have difficulty emerging and will require mechanical assistance to break up the surface crust to assist the seedlings. One should also avoid extremely high temperatures at planting times as this can inhibit the germination process. Every year has its challenges, and some years will not be successful due to factors which are not in our control. But, if we take advantage of the different crops we have available to us we can attempt to make the best out of a tough situation.